Must be 21 or older to purchase. Whoever purchases the alcoholic beverage must provide valid identification. And the person who is 21 or older must be same person as the purchaser of the order. A 6 pack of Singha Thai Lager. integrated in a complex yet balanced Cabernet Sauvignon. A bottle of Trivento Reserve Malbec. 2016-Mendoza, Argentina. 2016 Mendoza Argentina-This Chardonnay delivers a fresh and fruity character of white peach, pear and pineapple with citric hints. Aromas of white roses and brioche appear together with subtle notes of hazelnut and vanilla. A complex and elegant nose. 2017 Malborough, New Zeland. Minerality, sea salt and lime are the backbone to this wine. Rarangi presents fresh vibrant aromatics of citrus, lemongrass, guava and subtle coriander characters. 2016 Northern Italy Valdadige region-Our Pinot Grigio showcases aromas of floral and lemon mist with ripe juicy flavors of honeydew and apple filling the mouth. Bright acidity balanced with warm minerality create a lingering crisp finish. Lemon sherbet, fresh cream, Granny Smith apples, hints of baking spice, a subtle toastiness and a vibrant finish. 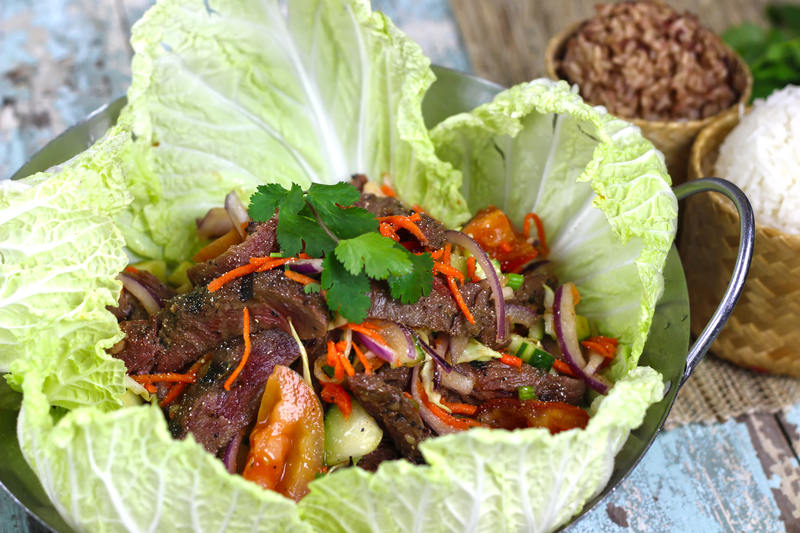 Our delicious Thai-Italian fusion dish! Fettuccine noodles stir fried with red curry sauce, tender sliced lamb, red bell peppers, sliced mushrooms and Thai basil, with shaved parmesan on top. For a limited time we are bringing this KetMoRee specialty dish back! Crispy vegetable pot stickers served with homemade ginger soy sauce. Marinated & grilled skewers of chicken (2-3 skewers) served with our homemade peanut sauce and cucumber salad. Crispy deep fried tofu served with a side of sweet chili sauce. Fried Pork chop covered in melted Monterey, Colby Jack, Parmesan. Ahi Tuna, cabbage, carrot, cucumber, red & green onion, cilantro, mint, traditional Thai medium spiced zesty dressing in lettuce cups (no substitution please)An order of 24 fresh oysters grilled with garlic cilantro butter. Portobello Mushrooms, and mixed vegetables wrapped and fried in rice paper served with our homemade sweet chili sauce. Seasoned ground free range/organic chicken sauteed with ginger, bell pepper, red and green onion, cilantro and basil. Crispy rice noodles and cashews served on the side with lettuce chips. Seasoned ground Vegan beef sauteed with ginger, bell pepper, red and green onion, cilantro and basil. 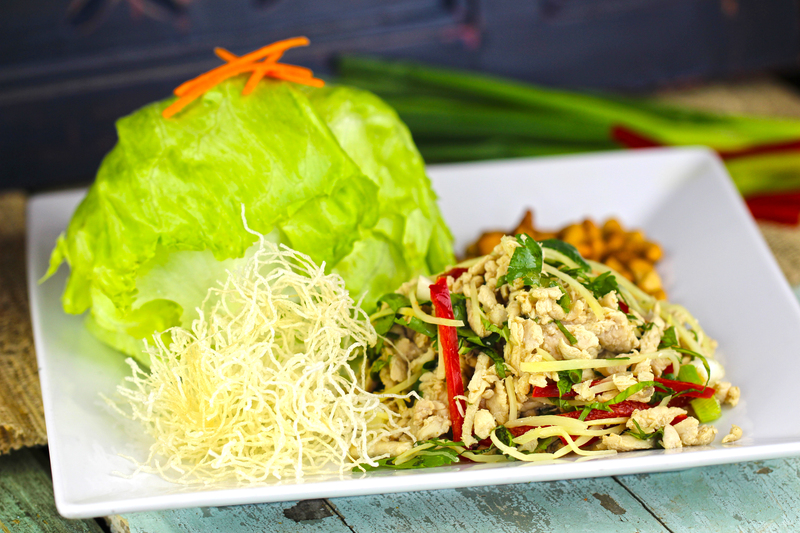 Crispy rice noodles and cashews served on the side with lettuce cups. Deep fried chicken pot stickers served with our homemade ginger soy sauce. Garlic butter naan served with red curry sauce. 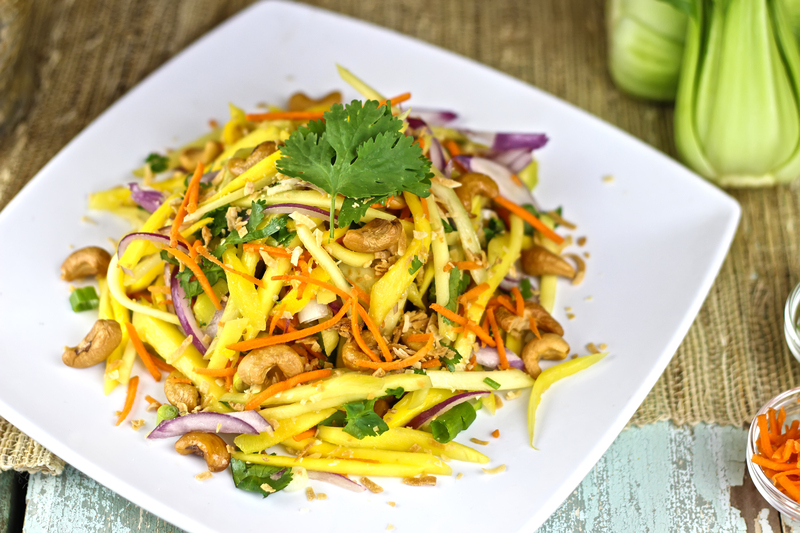 Salad with zesty shredded mango, coconut flakes, red and green onion, cilantro, carrot and cashews. Nice hot soups to warm up your day! Soothing coconut milk soup with mushroom, green onion, and cilantro. Restores the soul! Hot & sour soup with mushroom, cilantro, red and green onion. Perfect for a chilly fall day. 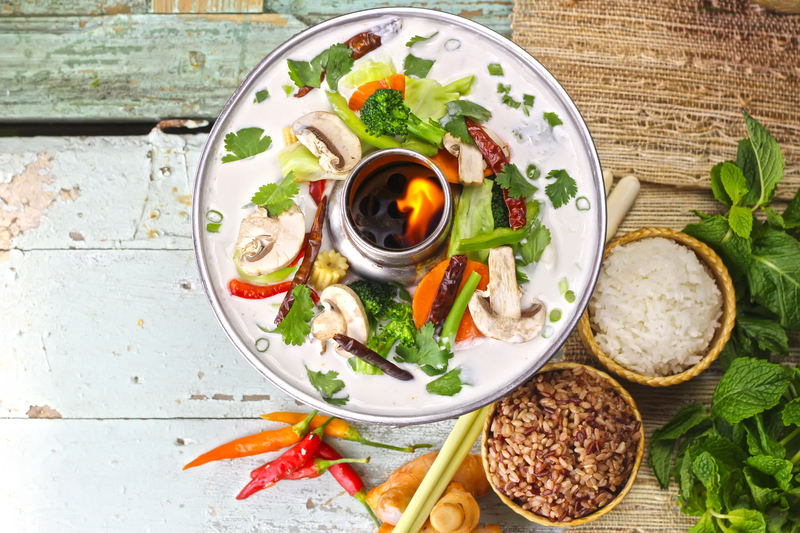 Seasonal mixed vegetables wok seared in a light flavorful Thai style sauce. Six ounces of fresh Canadian Salmon grilled and drizzled with red curry. Served with our herb seasoned broccoli and cauliflower rice, teriyaki sauce and a grilled lemon wedge. 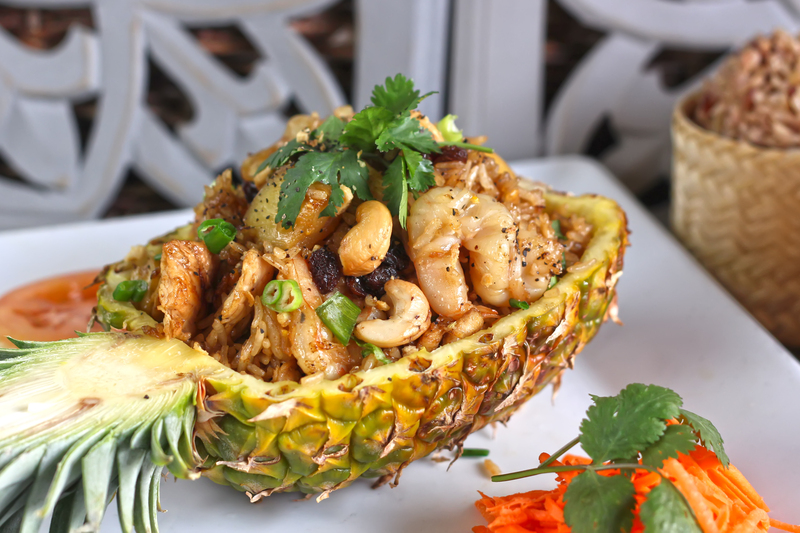 Fried rice with free range/organic chicken, prawn, egg, pineapple, cashews, raisins, cilantro, onion, and tomato served in half a fresh pineapple! Fried rice with egg, white onion, cilantro, and tomato. Topped with an over-medium egg. Tender sliced lamb sauteed with carrot, bell pepper, and onion, served on a sizzling platter and topped with crispy basil. Battered crispy eggplant topped with wok seared bell pepper, white onion and crispy basil. Delicious! Our homemade peanut sauce simmered with fresh seasonal vegetables on a bed of spinach. Peanut sauce lovers only. Sauteed with fresh and dry chili, garlic, bell pepper, green bean, carrot, white onion, & basil stir fried. 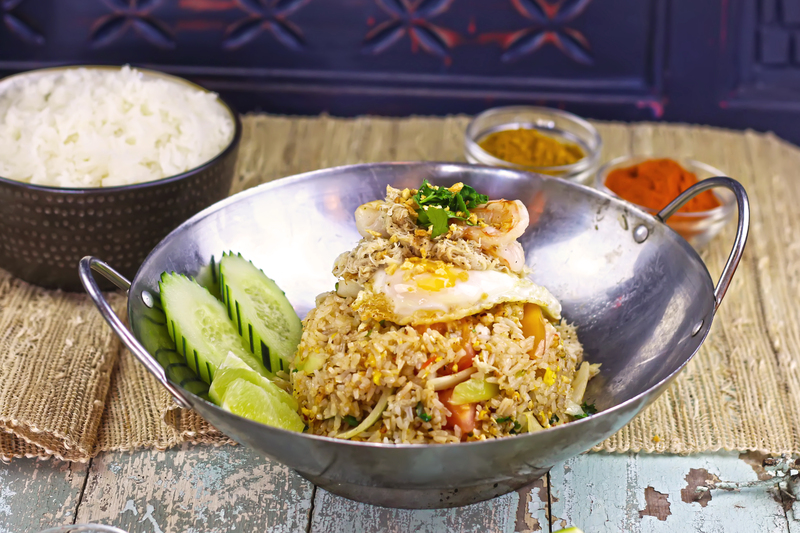 A staple of Thai Cuisine! Wok seared Bangkok style thin rice Noodles, tofu, egg, bean sprouts, & green onion. Wide Rice Noodles wok fried in a sweet soy sauce with egg, carrot, broccoli, and bean sprout. Roasted Duck simmered in coconut milk Red curry with a hint of spice along with bell pepper, carrots, green beans, pineapple, tomatoes and basil. 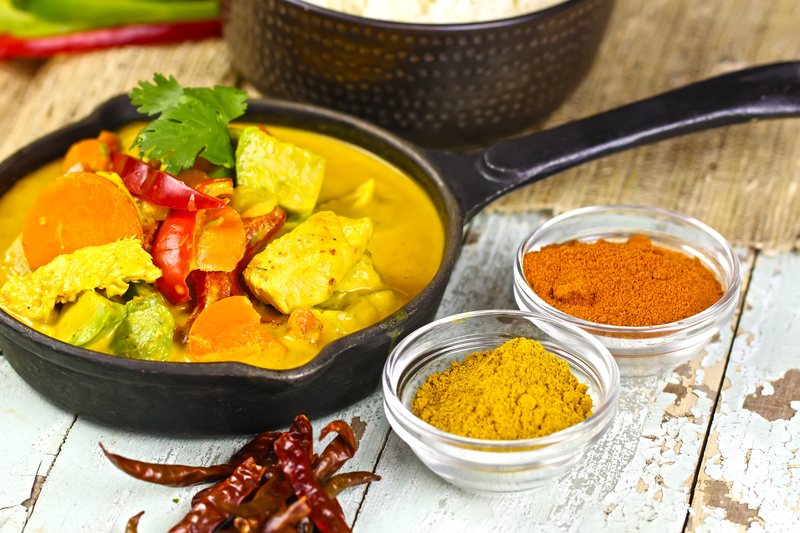 Coconut milk yellow curry with bell pepper, potato & carrot in our most popular curry. Coconut milk red curry with a hint of spice along with carrot, green bean, bell pepper, eggplant and basil. 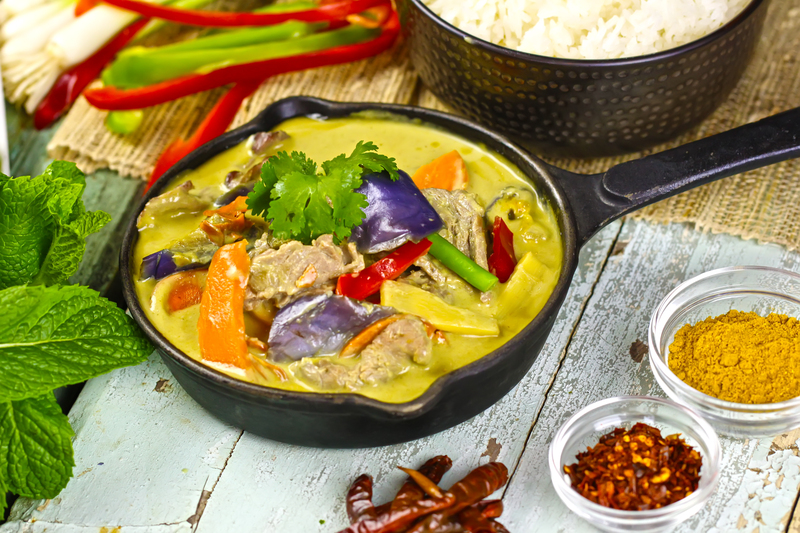 Coconut milk green curry with a hint of sweetness along with carrot, green bean, bell pepper, eggplant and basil. Stir fried prawns and succulent clam with chili paste and oyster sauce with basil, onion and bell pepper. Back by popular demand! A grilled Canadian Salmon fillet glazed in Thai Teriyaki Sauce and served with garlic sauteed seasonal mixed vegetables. It is served on a bed of brown rice and a wild bean blend. All time's favorite comfort food! Herb marinated and fried short ribs with sweet chili sauce and sticky rice on the side. Calamari, plum prawn, salmon pieces in our bold, rich, hot and sour soup along with thin rice noodle, mushroom, wonton chips, green onion, and cilantro. Blend of Monterey & Coldby Jack & Parmesan cheese, side of garlic butter naan. Lightly battered Salmon pieces tossed in authentic lemongrass-spiced sauce, mushroom, green beans, onion, and green young pepper.